The Heywood Hotel had me at “Hey.” Very thoughtful owners developed the property from a single-family home into a stunning and completely neighborhood-appropriate seven-room hotel. From the street, the Heywood modestly matches the scale of the small wooden houses that surround the hotel and make the neighborhood special. Inside, the lobby unfolds to reveal an upstairs courtyard, more guest rooms, and private patios and balconies. It’s just the place you want to call home when you’re visiting Austin. 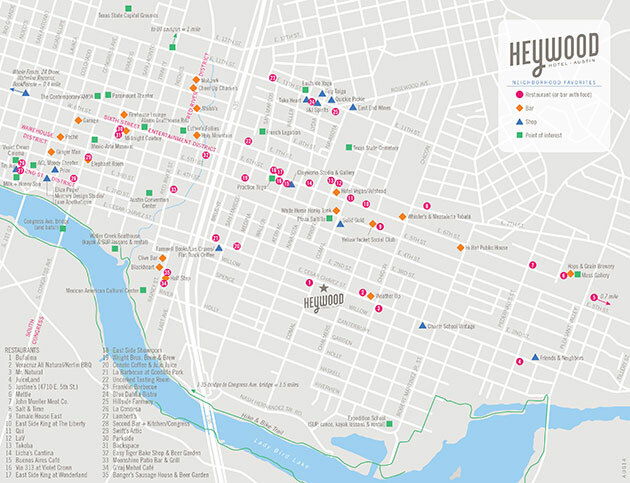 So I was thrilled to be called on to help the Heywood develop a “neighborhood favorites” map for their concierge to use. Heywood owner Kathy Setzer came up with a thorough list of the best sights, outdoor recreation opportunities, and spots to eat and drink within walking distance of the hotel. I couldn’t help but suggest a few more based on my eating adventures. The biggest challenge will be keeping the map updated as restaurants and shops pop up all over this rapidly changing neighborhood. As usual, I built the map file carefully using layers, so that future updates will be relatively easy to make. The map is very popular with our guests and our graphic designer was really impressed with it as well. The Heywood made Conde Nast Traveler’s “2013 Hotel Hot List: World’s Best New Hotels.” You can read & see more here. Congrats to Kathy & George and the hard working neighborly staff. See you in the neighborhood!